A unique Safari experience giving you the excitement and authenticity of staying in a tented room with the benefit of having all the amenities of a normal room such as an en-suite bathroom, tea/coffee facilities, and Aircon/Heater. Please note that your Safari can easily be extended to 4 or more days upon request. This Kruger Tented Safari departs daily from Johannesburg OR Tambo airport. You need to be at the OR Tambo bus terminal by 7.30 am. You will receive full instructions when you book your safari. The shuttle departs no later than 7.45 am. You travel East passing picturesque landscapes and farmlands on route to our lodge near Kruger. There are two 15 minute comfort stops en route. You will also be able to buy snacks and refreshments during these comfort stops. ETA in Hazyview is around 1 pm. The lodge driver will meet you at the drop off point and transfer you to the lodge where you will stay in the semi-luxury tented rooms. This will be a quick 5 to 10-minute drive. 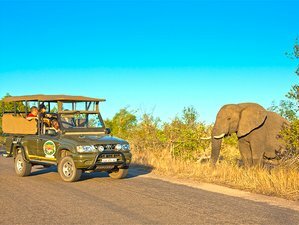 After checking in, you will have time to relax and freshen up before boarding an open-sided Landcruiser for an exciting two or two and a half hour sunset game drive in Kruger National Park. Even though the full day safari on the following day is the main day to search for the Big 5 and other wildlife, the Sunset Safari is a great indication of what to expect. If you are lucky, you may also get some lovely sightings including a wonderful sunset! The tented lodge is about 15 to 20 minutes drive from the Phabeni Kruger Gate. After your safari game drive, you return to the tented lodge where you can unwind, have drinks and relax. This morning you will enjoy coffee/tea and rusks before departing on a full day of game viewing in the Kruger National Park (Skukuza area). A Packed breakfast is included. Game drives are in small groups in specially modified open sided land cruisers. The Skukuza area is rich in wildlife and the elevated height of the 4×4 open-sided vehicle makes for excellent viewing and photographic opportunities. You’ll enjoy lunch at one of the park’s restaurants (own account). After lunch, we start the afternoon game drive in the Kruger National Park. During these game drives, you’ll see a wide variety of wildlife and have plenty of photographic opportunities. After our tour, we’ll make our way to back to our tented lodge. Just before 12 noon you will be transfered to the shuttle pickup point in Hazyview. You will then return to Johannesburg with the shuttle. There will be comfort stops on the way. Drop off at Johannesburg OR Tambo airport around 5.30 pm. This is the end of your 3 Days Kruger Tented Safari. This safari will take you to Hazyview, Kruger National Park, South Africa. The Kruger National Park is located in the low veld in the North Eastern region of South Africa and spans across two provinces, the Mpumalanga and Limpopo Provinces. It is not only the largest national game reserve in South Africa, it is also the most prestigious and impressive. This world-renowned park occupies and area of around 2 million hectares (20.000 square kilometres) and is home to a large variety of fauna and flora. The Kruger Park boasts the richest assortment of life forms in Southern Africa and as such offers one of the best safari and game viewing experiences possible. The park is about 360 kilometers long (from North to South) and about 65 kilometers wide (from East to West) and about the same size as Wales. The Kruger was formerly proclaimed a national park in 1926 and today it forms part of the Great Limpopo Frontier Park. This massive peace park links the Kruger with the the Gonarezhou National Park in Zimbabwe and with the Limpopo National Park in Mozambique. Zimbabwe lies to the North and Mozambique to the East of the Kruger Park. The Kruger Park is famous for its abundant wildlife and it is also a world leader in advanced environmental management techniques. Several rivers flow through the Kruger in an easterly direction, including the Sabie, Olifants, Crocodile, Letaba, Luvuvhu, and Limpopo Rivers. It is about 4.5 hours drive from Johannesburg to the southern part of the Kruger. Proudly South African inspired dishes served around an open fire. Special meal requirements are adhered to. Shuttle leaves from OR Tambo Airport (JNB) at 7am daily.